Home / News / How many biopics on Jayalalithaa? How many biopics on Jayalalithaa? Just a couple of days ago, we have mentioned that the makers of NTR and Kapil Dev biopics have also announced a biopic on actress turned politician J Jayalalithaa. Meanwhile a day ago Priyadaarshini, Tamil filmmaker announced a biopic on Jayalalitha. And here comes a third biopic announcement on the former Tamilnadu chief minister. 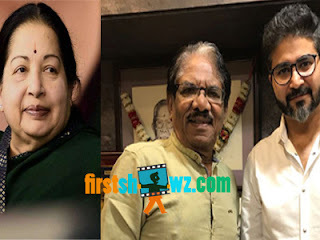 Yes, Veteran Tamil filmmaker Bharathiraja made an announcement that he is set to don the director cap for a biopic that focuses on Jayalalithaa’s illustrious life and legacy. He also announced that Aditya Bhardwaj will bankroll it and legendary music composer Ilayaraja will provide soundtrack. The former announced two biopics meanwhile will roll cameras from February 24, on the occasion of Jayaa’s birth anniversary. We'll have to see How many more biopics on Jayalalithaa will be announced.